Program to expand degree offerings and training resources for the cybersecurity industry. 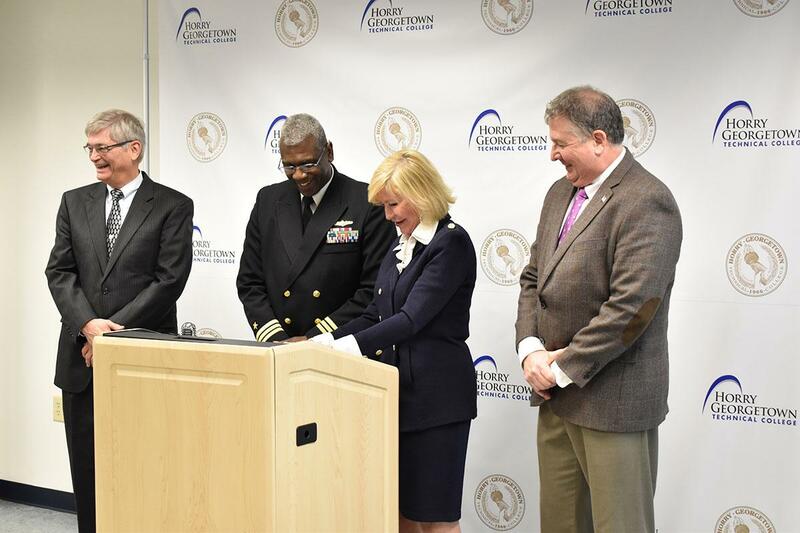 (Conway, SC) January 23, 2019 - Horry-Georgetown Technical College (HGTC) announced today a new cybersecurity grant program through with the Office of Naval Research (ONR) and an educational partnership with the Space and Naval Warfare Systems Center (SPAWARSYSCEN) Atlantic. The $750,000 grant and advanced cybersecurity degree program will not only create a pipeline to fill critical cybersecurity jobs at SPAWARSYCEN, but will also equip HGTC with state-of-the-art training technology and resources to meet cybersecurity training needs throughout South Carolina. The new program will be unique to South Carolina, North Carolina and Georgia. South Carolina’s cybersecurity sector has grown 134% over the past five years, well above the national growth rate of 91%. More than 2,300 cybersecurity jobs are unfilled statewide. New hires in the sector must enter organizations like SPAWAR with the capacity to function in an increasingly complex information technology environment that requires even greater technical ability, flexibility, and response times. The new Security Operations Center (SOC) Cyber Range and Forensics Lab at HGTC, coupled with expanded certificate and degree programs in cybersecurity and computer forensics, will target urgent Naval workforce needs. The lab will fully support student development of the required knowledge, skills, and abilities (KSAs) that will allow them to successfully evaluate established risk tolerance, work within a team approach, and help set priorities to manage risk consistently throughout an organization. Cybersecurity courses will use the lab to target hands-on mastery of the complexities of cyber-attacks and develop skills to classify the various type of network attacks and follow National Institute of Standards and Technology guidelines to counter threats. Horry-Georgetown Technical College currently offers a cybersecurity certificate, but the new educational partnership signed today will allow the college to enhance its certificate program and expand its offerings to a two-year associate degree program. The focus of the programs will be centered on cybersecurity with three different areas of concentration that address current and future workforce needs of the Navy: cybersecurity operations, ethical hacking and healthcare networking infrastructure; application development; and computer forensics. College officials see this program not only as a win for HGTC and the Navy, but also for Horry and Georgetown Counties. The training program will not be limited to HGTC students. Companies will be able to send their employees through training courses specific to their needs during the summer. Development of the lab will begin this spring, and HGTC’s new associate degree in cybersecurity will begin in the fall of 2020. For HGTC cybersecurity professor Stan Greenawalt, this is just the beginning. HGTC’s president also sees this opportunity as a mission. “This grant and partnership help HGTC not only fulfill our mission of embracing technological innovation in education and promoting economic growth, but it allows us to play a critical part in keeping our nation secure. For that, I am extremely proud and honored,” she said. 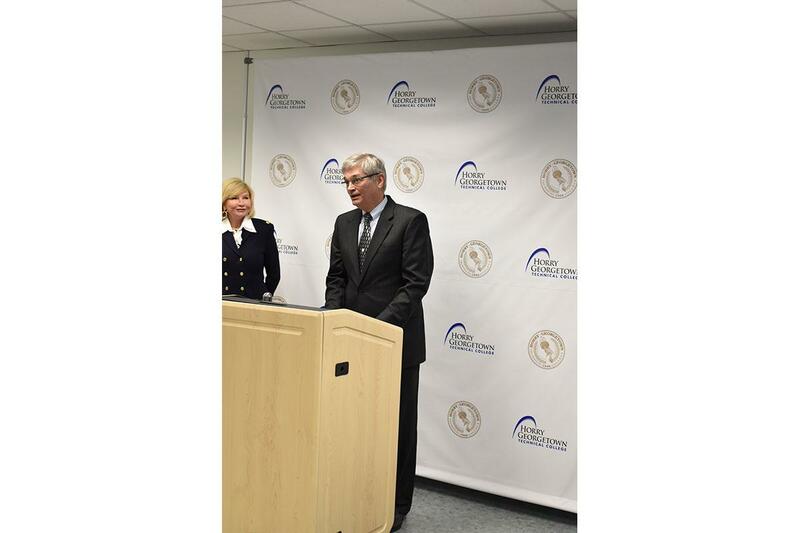 Horry-Georgetown Technical College President Dr. Marilyn Fore looks on as Professor Stan Greenawalt discusses the details of a $750,000 cybersecurity grant with the Office of Naval Research and an educational partnership with Space and Naval Warfare Systems Center Atlantic. HGTC Professor Stan Greenawalt, SPAWAR Executive Officer Commander Jeffrey Williams, USN, and SPAWAR Deputy Mission Assurance Competency Joe Henline look on as HGTC President Marilyn Fore signs a new educational partnership, which will allow the college to enhance its certificate program, expand its offerings to a two-year associate degree program, and serve as a workforce training pipeline for SPAWAR. 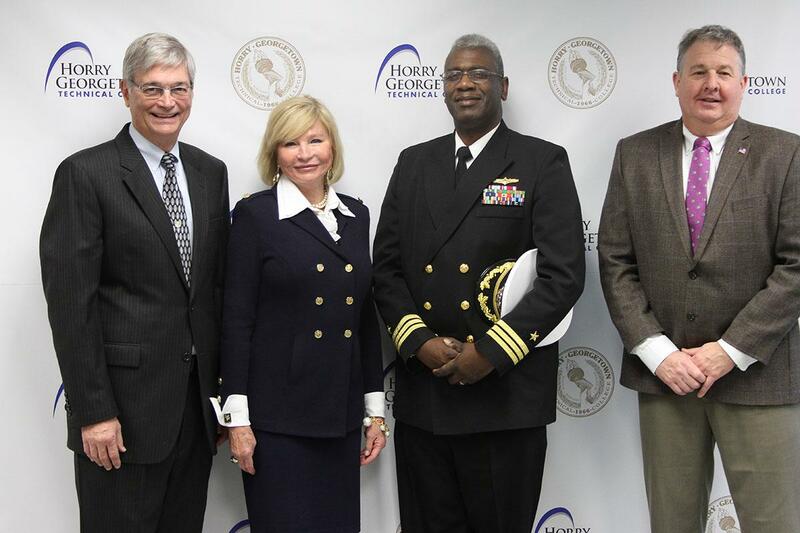 HGTC Professor Stan Greenawalt, HGTC President Marilyn Fore, SPAWAR Executive Officer Commander Jeffrey Williams, USN, and SPAWAR Deputy Mission Assurance Competency Joe Henline at today’s press conference. 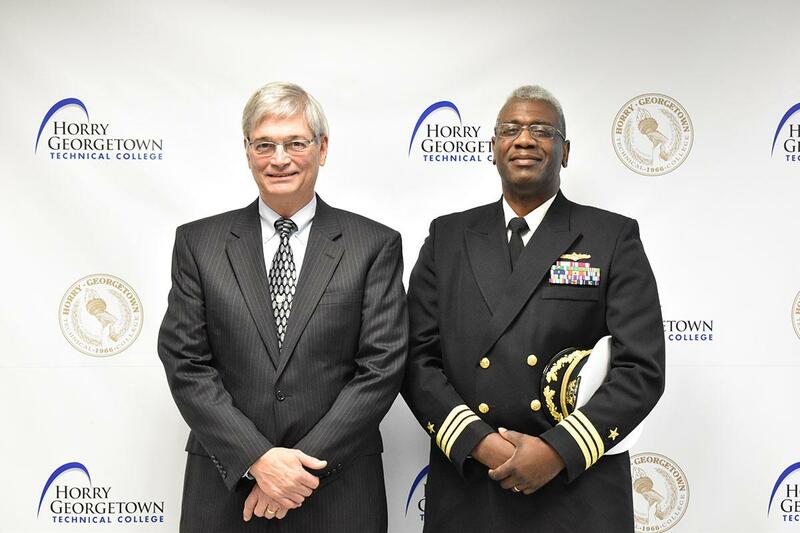 HGTC Professor Stan Greenawalt, a retired Navy Captain, with SPAWAR Executive Officer Commander Jeffrey Williams, USN, after the press conference. 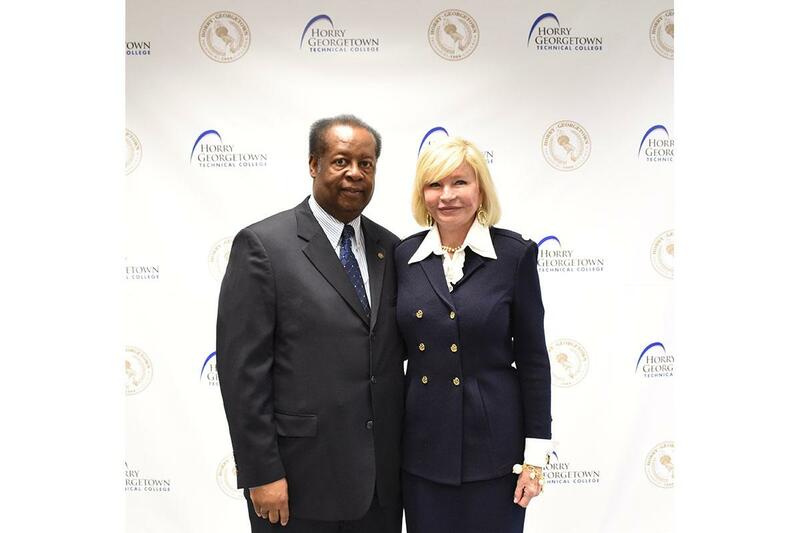 Representative Carl Anderson (Georgetown) with HGTC President Marilyn Fore after the press conference. College officials see this program not only as a win for HGTC and the Navy, but also for Horry and Georgetown Counties’ workforce training and economic development.